"The light at the end of the tunnel is not an illusion. The tunnel is. " There are many reported haunted tunnels located around the world. A tunnel is a passageway that is typically located underground. These passageways are considered to be quite long and are typically enclosed on each and every single side. Most tunnels have an opening at each particular end. There are many different types of tunnels located throughout our world. There are man-made tunnels that assist in traffic control, tunnels where water passes, tunnels established for endangered species, tunnels that assist in providing utilities to residential and business districts, tunnels for transportation such as underground subways, and tunnels that have been used secretly so that certain groups of individuals could move from one location to another safely. Throughout history, many people have experienced what they believe to be haunted tunnels. There are many different stories in circulation about lost spirits, demonic spirits, and other types of paranormal based entities haunting tunnels. Many individuals have expressed the fact that they have visually observed spiritual based entities in these spaces. There are some that have felt an actual presence through the means of cold spots, or unexplained breezes. Many have heard sounds emerging from deep within tunnels where no logical explanation exists. These sounds include crying, screaming, laughing, talking, and even soft whispers. It is not at all unusual for a glimpse of a shadowy figure out of the corner of the eye to be experienced, or for an individual to experience an intense degree of fear while exploring tunnels located around the world. Scientists and paranormal investigators have many theories on the events that have transpired in the assumed paranormal activity within tunnels throughout history. However, no conclusive evidence has been established that the events are not related to ghosts, spirits, angels, and demons like so many have felt that they have experienced. There are ghost videos, ghost pictures, and even EVPs that DO seem to point towards the evidence of the paranormal. If you are interested in mysterious places, and stories that are related to the paranormal, you will thoroughly enjoy this section of Haunted Places to Go on haunted tunnels that are located throughout the world. 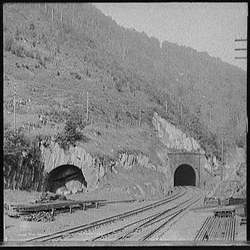 The Hoosac Tunnel has been rumored to carry several spirits. 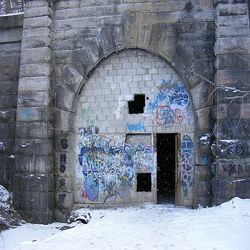 While many refer to the paranormal activity in the Moonville Tunnel as the “Moonville Ghost”, most agree that there is more than one spirit haunting this landmark. As a result of the emotional energy that took place in the tunnels, many different reports of paranormal activity have been reported in the popular, dark tunnels.